have arrived for what in many ways seems like a friendly cricket test match. No sledging allowed – although Hamid Karzai, President of the Islamic Republic of Afghanistan was able to slip in a quip about Afghanis not tapping phones. Debates about niqabs, the place of religious schools, immigration, race, and beer at football tournaments have been put on hold. This is about how UK plc can pull off their claims of being the host with the most. Test match captain Prime Minister David Cameron, supported by all-rounder Mayor of London Boris ‘Beefy Botham’ Johnson, have declared London open for business. We’re off the mark and what could go wrong? We have our best buddies Malaysia in the pavilion, the event is being held at the London ExCel Exhibition Centre [owned by Abu Dhabi National Exhibitions Company (ADNEC)], overlooking the Emirates Royal Docks. So Londonistan is no longer a moniker for kebabs and niqabs – now witness the anointing of Londonistan as a hub for the Muslim world – attractive for is agile secular shari’ah friendly law, financial services, and academic institutions. One quarter of the world’s population are Muslim, 60% of whom are under the age of 24. The global Halal market is currently worth US$2.3 trillion, the global Islamic finance sector will reach US$2 trillion by 2015, and the Middle East has seen a 78% growth in brand value, based on demands for Islamic banking products and services. Muslims are reported as the 3rd ‘next billion’ in terms of market opportunity, following global interest in Indian and Chinese billions. It’s also worth mentioning that India has 160 million Muslims and China has 50 million Muslims. So there you have it: an event and a meeting of minds drawn together in what could be grouped into three reasons. The consumer-based perspective – where beyond market value and size, there exists a consumer-based religious obligation to develop the sector. But along the way, profiting from Prophethood [Muhammad, peace be upon him] is okay too. The geopolitical imperative – where commerce linked with Islam is influenced by geopolitics, and is crucial to international relations, political stability and national brand equities. O you who have believed, do not consumer one another’s wealth unjustly, instead only engage [in lawful] business by mutual consent. And do not kill yourselves [or one another]. Indeed, Allah is to you ever merciful. Opening batsmen, Hon. 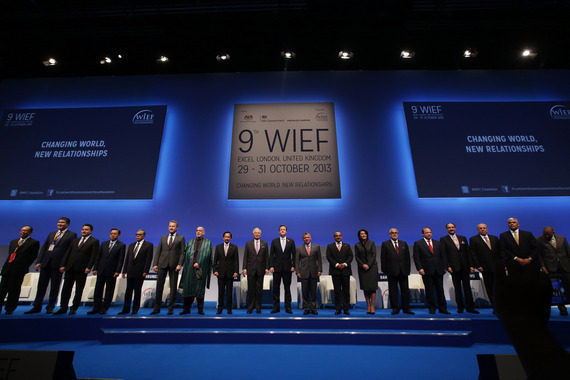 Tun Musa Hitam Chairman of WIEF, and Malaysian Prime Minister H.E. Dato’ Sri Mohd Najib Tun Abdul Razak, built a solid foundation – setting the tone for the forum by scoring runs highlighting four key areas of interest: women, youth, education, and SMEs (small and medium enterprises). Dato’ Sri Mohd Najib dedicated a large part of his keynote to the importance of women (to a largely male and applauding audience). He was pleased to announce that two thirds of students in tertiary education are women in Malaysia. Islam was presented as offering encouragement towards legal and financial independence. He also relayed the story of Khadijah, the first convert to Islam. Muhammad was later to become that Prophet Muhammad whom we are familiar with. The batting line-up of distinguished leaders opened up discussions further – with Prime Ministers, Presidents and Royalty from: Bahrain, Bangladesh, Bermuda, Bosnia and Herzegovina, Brunei, Indonesia, Iraq, Jordan, Kazakhstan, Kosovo, Kuwait, Morocco, Pakistan, and Turkey. Craig Cannonier, Premier of Bermuda used his slot to throw Cameron a googly, by championing Bermuda as a safe haven for Islamic finance – as the Island currently occupies 36% of the global reinsurance market, with 1,200 international companies having licenses valued at US$450 billion. The ascendance of English language is also interesting. Of course English is the worldwide language of business and Arabic is the language of Islam. Arabic and English are not the mother tongue of the majority of Muslims, but English has moved into pole position as being the language of choice to communicate across nations. So, English has grown in its importance in connection with Islam – with only leaders from Morocco and Kuwait choosing to deliver their speeches in Arabic. And with that a confident Cameron buttoned his jacket and like Elvis left the podium.